The girls room just got a little bit more pink. I never knew such a pouf would be so popular around this place. We are undergoing a few updates that I can't wait to share. I finally got around to sending off for an estimate to have that dressing table between the girls bed lacquered. I hope it is not too expensive. Anybody have experience with lacquering furniture? Where did you get that fantastic pouf?! OH MY GAWWWWD! I love the pouf! LOVE it! I have a POUF pillow that gets a LOT of love her from everyone but especially the kids. (I have twins 1 more) Their friends act as though it's the best thing ever made! you just stop it right now. just stop it. i big puffy pouf heart you! how could your girls NOT love it?! Love your fabulous pouf. Have never had anything lacquered but most definitely love the look!! Home Goods. Yessssss. I have asked to be taken shopping there (and other places, too, probably) for my birthday. I want a pouf for my son's room, his little "reading nook". Okay, no experience lacquering furny here, but I'm long overdue for a comment as you've been doling out some serious delishness this week. Gorgeous-glam-bam pouf (go HG! right?) and absolutely divine childrens' rooms below. Plus, Sophia and that headboard -- huzzah. Rustoleum makes spray lacquer, but it only comes in a black, white or red. And clear if you want to apply it over a color. It's pretty easy to use, but DO NOT use inside. I learned that the hard way. And, that is the best pouf I've ever seen!! You can have furniture painted at an auto body shop for the glossy lacquer look. Fun! Why is there no Home Goods store in Phoenix? why all on the outskirts! ugh. must make trip out of the neighborhood. get a good refinisher is all i can say. hubby and i tried refinishing ourselves at it is a true nightmare if you want it done right. good luck can't wait to see the results. great post! That pouf is to die. Exactly what I am looking for to sub in for an ottoman in my nursery! Hopefully Home Goods will pull through for me! What a fantastic pouf! It's the perfect seating solution! 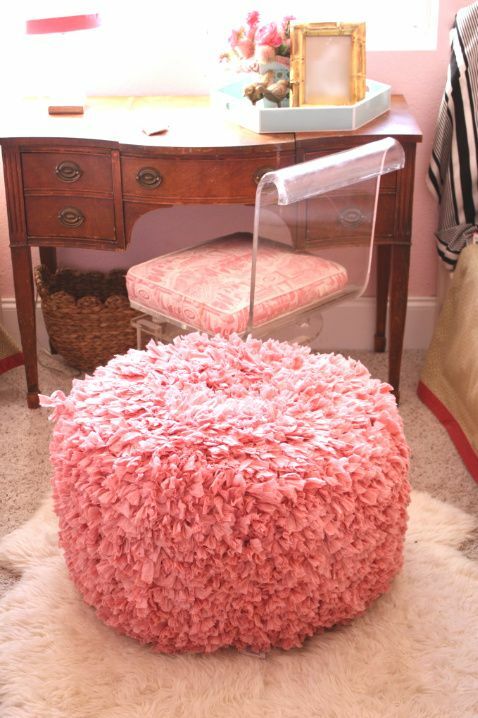 This pink pouf is perfection! Cannot wait to see the completed room for your girls. They are lucky little ladies. That pouf is adorable and fun! LOVE the pouf. Wailing over the lack of a Home Goods store. I totally saw those at Home Goods and wanted to buy one so bad! Looks darling! I deleted my post because I didn't spell "their" correctly. I was too quick with the send button!